Have you got someone funny in your family? By funny I mean sometimes predictable, always quirky and that person that just makes you roll your eyes and chuckle because that’s what family do. My sister is creative and arty and is a great talker. Hell you can plonk her in a room with any person in the world and she could talk to them until they plain ran out of words. Last month it was our brother in law’s birthday he loves music and doesn’t have an ipod, so she very thoughtfully bought him a CD. It was a little while before they crossed paths so when she had coffee with our other sister she passed the CD on to be given to the brother in law. The other sister took the CD home to him wrapped very nicely and he was excited to see it was a CD he was really looking forward to listening to. When he opened it to have a listen the box was empty. No one was surprised, no not one of us. When we were having a laugh at her expense at lunch the other day, not only could she not find the CD still, she couldn’t even remember listening to it. Eye roll. 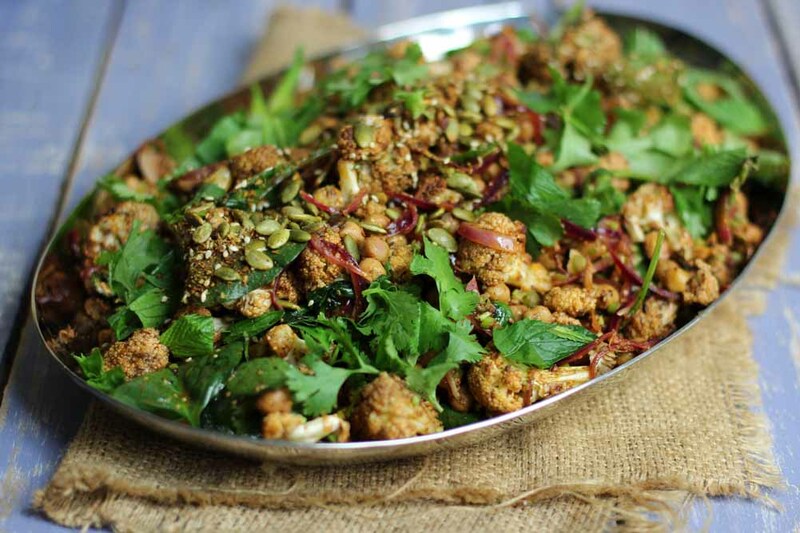 There were no eye rolls when we ate this Spice Roasted Cauliflower, Chickpea salad though. It’s the sort of salad that you can eat warm or anyway it comes but whatever temperature you eat it it will be on a big plate, a great salad for any time of the year. It’s roasty and fresh and has lots of crunchy bits. It’s got one of my favourite ingredients oh no two chickpeas and cauliflower. It packs a surprising amount of flavour and will be the most popular dish on the table. I guarantee it. Meanwhile prepare the flavour boost. Put a non stick pan onto the stove and warm it. Add a little oil and the sliced onion. Toss for a minute till just starting to soften. Add the spices and heat through. Add the chickpeas and cook until fragrant. Turn off the heat and let cool a bit before adding the 3 tablespoons lemon juice, the dijon mustard and the very finely chopped coriander stems. pour all of this into the cauliflower and mix well. Add the coriander, mint and spinach. That is a funny story regarding your sister – I am sure she lightens things up even if she may also be frustrating at times! It’s fun to have a sister like yours, Tania. This salad looks absolutely delicious! Great story about the CD! 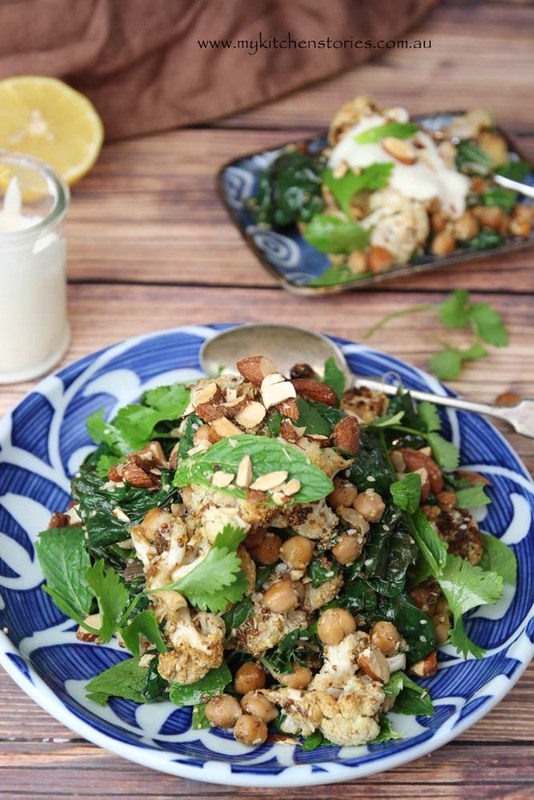 This recipe looks great, love cauli! Yes to this! 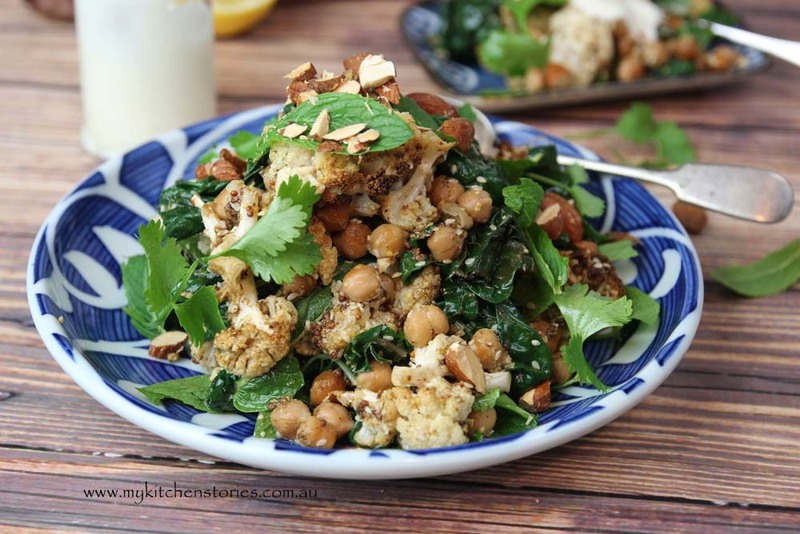 I love chick peas and cauliflower so this is right up my alley – what a delicious salad! I’m sure it’s great for lunch or as a dinner side. I can’t wait to try this. Thanks for sharing! That’s hilarious! I wonder if the shop forgot to put it in? I never check when I buy them especially if it is for a gift as I don’t listen to them. You have totally hit the nail on the head with this salad! 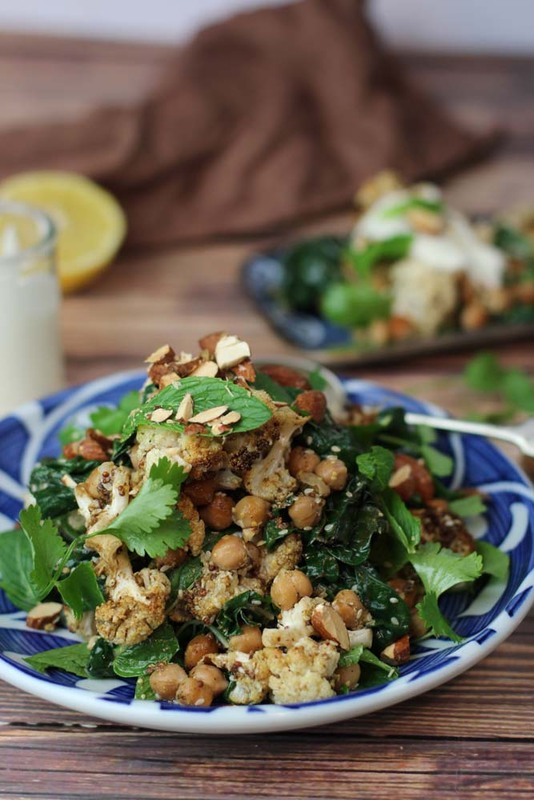 All of my fave things – cauliflower, lemon and chickpeas! Yum. I’m definitely going to make this during the week. Thanks!! Roasted cauliflower is one of my favourite things in the world. Makes such a terrific salad. Will definitely borrow this recipe for future picnics. I LOVE lots of crunchy bits—your salad sounds divine! 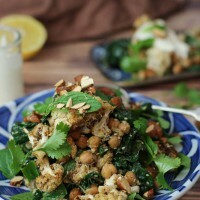 Between the roasted cauliflower and the chick peas, I’d be in heaven!!! This is such a great idea. It combines 2 of my favorite salads into one very flavorful dish. I really must try this. Thanks for sharing. I love the crunchy bits in this salad. Hi there ! I stumbled across you on the FBC page 🙂 what a fantastic salad. I love sumac and have been wondering what to do with the pot of it in my cupboard. This looks like a fantastic, virtuous dish. Thanks for sharing! What a gorgeous salad. The flavors in it sound amazing. Was the CD ever found? Hi Christie. thanks and happy new Year. yes the CD turned up, played and still wanted by the receiver! This looks amazing and so fresh! Beautiful pics! Thanks for sharing! Cauliflower is just the most wonderful vegetable, isn’t it? So versatile. It’s one of my favorites and I’m always looking for new ways to enjoy it. This looks so superbly fabulous. Loving the look of it. 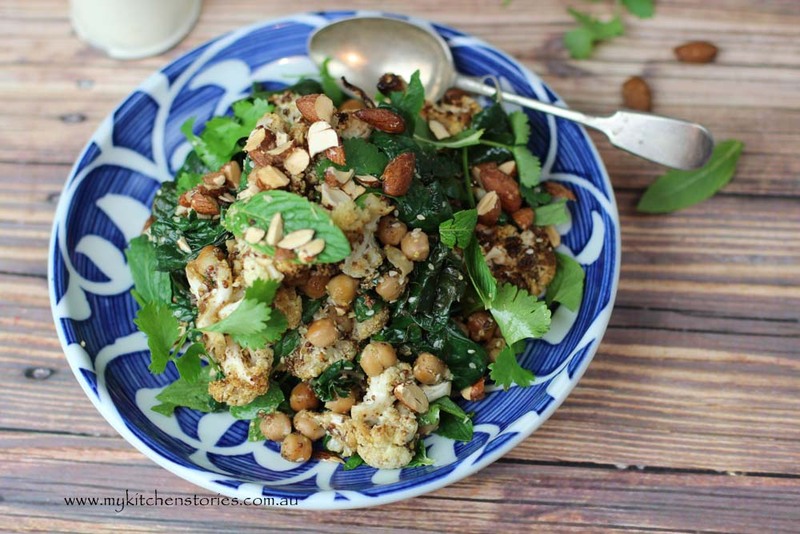 I Lurve roasted cauliflower and the north African/Arabic seasoning you have on yours sounds delightful! Your sister sounds like quite the hoot. She clearly has the mind of an artist. But the big question is did she ever find that cd? Or is she still searching high and low for it? While you might not have the cd. . .at least you have this chickpea salad. I am a huge fan of chickpeas and I absolutely adore all the different flavors you’ve added to this salad. Yes my sister is quite a hoot and definitely”arty”. She did find the CD and we even played it when we were together again at Christmas!. Yes I have the chickpea salad and i have it often! This sounds amazing! Now I am curious about dukkah. I’m going to have to see if my grocery store carries it, so that I can try it. Hi Willow. It’s a really useful mix that I tend to useon everything!